Back-to-back family meals, holiday parties, shopping, crowds, it's easy to understand how the most wonderful time of the year may feel a bit overwhelming. 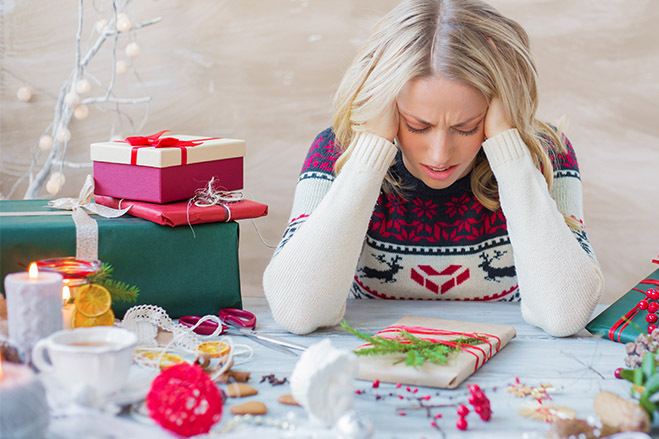 We asked our Berry Believers how they keep their holiday stress to a minimum. Here are their answers. Kym: Notice those items your gift receivers would enjoy ahead of time and purchase them right away. Anne: Planning well and staying organized. Also keeping myself healthy so I can be my best each day. Mary: I cut out anything that causes stress. I gave all my Christmas decorations to my children as those are their memories now. I put up a much smaller tree, add a poinsettia and voila! No more Christmas cards. I send emails or FB posts. Limit the number of parties and make the dinners potluck. Beth: I start my shopping early, I already have everything wrapped. That leaves me time to enjoy cooking and celebrating! Kimberly: I plan ahead and start shopping early. I try to focus more on making memories and not stressing if everything isn’t perfect. Louisa: Plan ahead and be organized. Take a little time for me and get some sleep! Savor every moment with the ones I love? Karen: I get gifts throughout the year and stash them I also get the decorations organized early and do heavy cleaning beforehand. Ellen: If I start feeling overwhelmed, I take a short nap and then start fresh and relaxed again. Kelly: I love meditation, it really helps be me. Ellie: By practicing mindfulness. I have not indulged in the craziness in 20 years. Danielle: I try and plan for multiple outcomes. Something always goes wrong! Krystal: Take deep breaths and do not try doing everything by yourself. Gaylene: I plan ahead and take some me time with soothing music and hot tea. Shelly: I shop early, make lists and stay organized! Shirley: DO NOT SHOP ON BLACK FRIDAY! Angela: I do not allow stress in! If we are together, it's a great holiday! Rhonda: I exercise and do yoga to help ease stress. Sondra: Hot baths and good books always help with my stress levels. Annette: I make a list, start early, and stick to the list. Pat: Don't try to do everything yourself. Ask for help. Patty: Stay hydrated and get plenty of rest. Valerie: Make a list and do most of my shopping online. Joni: Staying organized and making lists and checking them twice. Savor the moments. Kaye: I take time for myself when I feel like things are getting stressful. Heather: I take time to go out in nature and just enjoy the quiet. It is calming. Brenda: Just take it one day and one hour at a time. It's just family so why worry. Anne: Plan as much as possible and avoid stores. Janet: I try to eat healthy, get enough rest and drink chamomile tea. Sandra: I have a box that I fill up during the year with special gifts I buy at the store and by Christmas time I don’t do any shopping, I already have the gifts for my loved ones and I spend more time making memories with my family? Rita: Keep the holiday music playing! Melissa: I don't let things get to me! Nicole: Don't take on too much to begin with. Kim: You have to believe things will work out and not stress. Marie: Stay focused. Set time limits for each task and stick to your schedule. Anita: I take time out for me...have ME time. Tasha: I save and shop all year round! Janet: I give myself a weekly facial. Karla: I make sure to take time for myself. Brenda: Keeping within my budget keeps it less stressful. Stacy: I sing loud in the car. Brian: Go drink some beers.